When I was in my twenties, I lived in Kansas and studied voice with a woman from North Carolina named Becky Clapp Ollington. She was married to a salty Aussie musician and had two sons. I enjoyed her and her family. They brightened up my life more than I realized at the time. Becky had been stricken with polio in her youth (before Salk) and had spent her life crippled from it. She walked with crutches , her legs in braces. Yet her smile and musical greeting lifted one from the lowest of spirits. After I left Kansas I became pregnant with my first child. I wrote to Becky and she sent me a lovely silver cup. I soon discovered that she had developed pancreatic cancer and had a limited amount of time to live. She died before my baby was born and that was when I realized how much she had brightened my life. Her loss left a huge hole. I often wondered what it would have been like if she had been able to beat the cancer and gone into remission…….if she were still with us today. 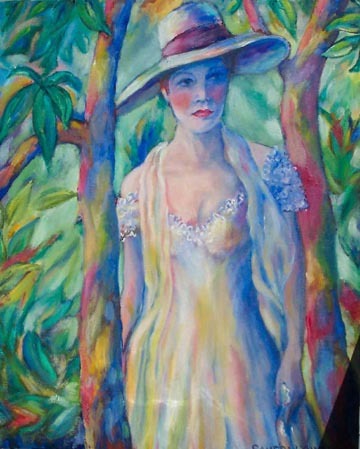 When I was working on this painting of lady in white I felt she was definitely Southern and soon began to see the face of Becky emerge from the canvas. I continued to work on it and the likeness went away, nevertheless, I decided to name it Becky in Remission and imagined her walking through the trees in the peak of health. ~ by Sandra Lynn Gray on June 28, 2007. Sandra, this is beautiful. Thank you. Your presence in Kansas in my youth also brightened my life. Your “Aldonza” still resonates with me. And I remember your beautiful singing voice. I am touched, Sandra Lynn Gray. Thank you for sharing your feelings about my mother. How stunning to discover that you are able to see this and write to me. No one I had kept up with seemed to know where you boys were. Isn’t modern technology great! Everyone adored your mother. What an amazing woman! I could never have sung Aldonza without her. I didn’t think I could and was scared to death. She kept saying I could and I did. The credit goes to her because, without her training and working with me, my little singing voice would not have been up to it. It was a rare tour de force in my life’s short list of accomplishments and she was responsible for it. She had this strength that gave everyone an example to aim for. George and I went to her funeral in Siler City and that was the last time we saw your father. We loved him too. He saw our new baby and said we had done a good job….. in his very wry Australian inflection. He had fantastic musical talent as I look back. It was taken for granted then. My son (my youngest child) majored in music. This is a beautiful painting Sandra, and a beautiful story about my grandmother. Thank you. Left me with a tear in my eye. Becky was special to all of us who knew her. What a great painting! WOW, Mark Ollington knew my grandparents here in Australia, and we have kept in contact with the family, I have been writing to Marcus for almost 40 years!….beautiful painting. Sandy… flash fromthe past! I wasmlooking up becky ollington on google. as I may audition for the chorus of honolulus opera season and may audition with a song I learned fro becky!! and I found you! Hi… are you still married to george. I am still married to Roger though at times I know not why! Please write and say hi, where do you live>I am in Mililani Hawaii, a surfer girl at 58… but come back to mainland about 3 times a yr to see my mom. I love minn and will keep coming back, though my mom died this yr jan 14.. Kathleen kelly Gluek. I miss her… All love. ps I am an artist too. watercolors! Molly, I cannot reply to the Yahoo address that was sent as your email server. It bounces back. I don’t know if you will ever see this relpy, either. Sandra, I just happened across this web page as I am researching former K-State people that worked with Wesley Van Tassel… We are having a reunion in Kansas City, August 5-7, and I am trying desparately to find the chronology of all of his theatre companies! Just this weekend, Yvonne Ghareeb and I were working hard to come across names and faces, and in my notes, I have you down as playing Alsonza in La Mancha. Looking for dates on Marc and Becky was what led me to this website. There are truly no mistakes in life! So, I have to ask: do you still sing??? Do I still sing. Haha Contact me on Facebook….. https://www.facebook.com/profile.php?id=1180501695 I will add you as a friend and we can exchange info there. Sandra, David Ollington emailed me yesterday that the American Heartland Theatre in Crown Center in Kansas City was closing at the end of this season. I have some marvelous memories from shows I did there. Answered David and in turn he replied to both Wes and me sending along a picture of your beautiful “Becky in Remission”. How willowy and beautiful this southern lady, just like sweet Becky. Those of us who were fortunate to know her, lucky. Those of us who were fortunate to work with her, embossed and improved. Those of us who heard her sing, elevated to new heights. Her smile, her laughter still remains with me. She is one of the few individuals in my life that I can truly say made such a lasting impression. painting made its journey around to us.